Amanda Hocking is the wildly popular self-published young adult author famous for reaching 1 million sales on Kindle and then moving into traditional publishing in a deal with St. Martin’s press. Today is the re-release day of the first book in the series, Switched, which now contains a new, never-before-published bonus story, The Vittra Attacks, set in the magical world of the Trylle. St. Martin’s is giving away 25 copies of Switched and I’m lucky enough to host one of the giveaways! unravel—all because of Finn Holmes. has more to do with her fierce attraction to him than she’d ever admit. changeling who was switched at birth—and he’s come to take her home. world she never knew existed, one that’s both beautiful and frightening. I’d like to personally thank Amanda for paving the road for self-published authors, especially young adult authors. In the acknowledgments of Switched, Amanda gracefully thanks many of the author-friends who helped along the way, including fellow Indelibles author Stacey Wallace Benefiel, making it especially cool to be able to take part in the re-launch of Amanda’s series through St. Martin’s Press. TO ENTER: Fill out the form below. Winner will be randomly selected and will receive a copy of Switched directly from St. Martin’s Press. OPEN UNTIL THURSDAY 1/5 8:00 am EST when a winner will be selected and announced. UPDATE: Sorry! Open to US and Canada only! 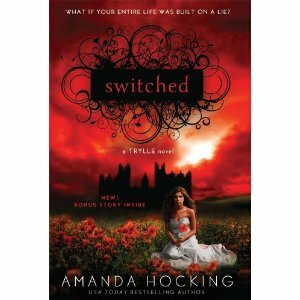 WINNER of Amanda Hocking’s novel SWITCHED … Katherine Dodgers! Thanks to everyone who entered and to St. Martin’s press for offering up a copy of SWITCHED! I love her new cover! I read the ebook and thought it was terrific! The trailer was great too. Wow. Her sales are fabulous!! I love the cover!! She really is amazing. Nice to see a Minnesota peep making it, too. That was one of the best trailers I've seen. Most people use a cheesy Power Point Presentation, add words, and music, and hope people like it. This looked like a real movie trailer. Well done and best wishes for more sales for Amanda in 2012! That new cover is gorgeous. I read (and re-read) this series about a year ago. It's SO good. I can't wait to get the print versions. Another book for my 'to read' list. I have not yet read this series but I am a HUGE fan of Hollowland and Hollowmen by Amanda! LOVE HER WRITING! I cant wait to get this series to read! Thanks for the chance to win!! I love the one thing Amanda always mentions when asked what her "secret to success" was/is. She's never claimed perfection or some magic formula. She wrote. A lot. And self published on a regular basis. She wrote what she loved and others just happened to like the story too…a lot of others. I'm so glad for her success and hope her re-release is just as wonderful. I've read this book. It's a rip off of Twilight the same as Lev Grossman's Magicians is a ripoff of Harry Potter and Narnia. Yeah, we are entered! Unfortunately we never win anything. I just heard about this series. It sounds awesome. Thanks for the giveaway. Wow on that trailer. I didn't want to read the book before, but I do now. Haven't read anything by her, but of course, I have heard about her. I've heard of her, just never read any of her books yet. This has been on my TBR list, so I'd love to win it!! I read Amanda's path to best-sellerdom on her blog, it was fascinating. Oh, I like the Changeling angle. I am picky on my paranormal, but that is a strand I really like. And I've been really curious about Amanda's writing. The covers for this series are stunning! And wow, that trailer was awesome. Almost like a movie trailer! I didn't see anywhere if the competition is open internationally, so I entered anyway. Thanks for hosting! I think what she has accomplished is amazing. The trailer was great. I'd love to win her book. Oh my gosh, how exciting!! Can't wait to read it! I've been meaning to read one of her books and haven't gotten around to it yet. I've considered self publishing and am still not sure what path I want to take, but I'm incredibly grateful for the people who've paved the way and shown that self publishing can be a viable option. It's going onto my "To Read" list. Great trailer.